Wow! First week back to school is done (thank the God and Goddess!!!) and boy did I need this four-day vacation. This semester, I’m taking 18 credits (yeah, I don’t know how that happened…) and two nights a week I have back-to-back night classes that keep me at school until 9-10 o’clock at night. Not to mention the classes are FOUR HOURS LONG! I have to do all my homework in the morning before my classes start and it was brutal. I’m already starting to feel burnt out. I have a big gap in the mornings before classes start at one and I can get my work done in the cafe as I usually do every semester. But my killer classes are Public Speaking and World Literature. And the funny thing…I have the same teacher for both (Insert crying laugh here). Don’t get me wrong, I love literature. From the modern Frankl to classical Shakespeare. But that class is four hours of sitting that gets me. That and the forced public speaking. For many of you, you guys know that I’m not the talkative type. I’m barely able to communicate successfully with people in my own household. Now if I don’t talk,( also known as embarrassing myself in front of others) I get an F. Why! But I have awesome news as well. Everyone, I have discovered the addictive powers of Japanese and Korean Drama television shows. 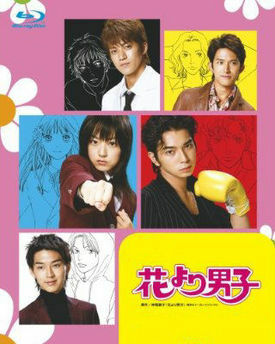 I was sitting in the computer room with my friends Areianna and Megan when I was introduced to a show called “Hana Yori Dango” or “Boys before/over Flowers” based off a Japanese manga with the same name. It’s about a girl from a poor family who manages to get a scholarship to go to a school for the sons and daughters of the riches families in Japan. But because of her modest family she’s outcasted and tormented by her richer classmates. especially four boys who call themselves the F4. They rule the school with an iron fist and can do whatever they want to whoever they want. And the leader’s new target is her. But to the leader’s dismay, he slowly begins to fall in love with her. When I got home I watched the entire series and loved it! Then I moved on to the Korean version of the series…then to the anime…then read the manga…and I loved it all! Now I’m watching another Korean show called “Playful Kiss” and I’m loving that too! And it doesn’t hurt that the guys on the shows are pretty hot…sorry lost my train of thought.